Coming a long ways since their first single in 1990, Onyx is a New York mainstay hip-hop artist. Originally consisting of Sticky Fingaz, Fredro Starr, Sonsee, and Big DS, the group has achieved worldwide fame with hits such as “Slam” and “Last Dayz.” Although Big DS left the group and passed away after their debut album Bacdafucup, and Sonsee parted ways in roughly the early 2010s, both Sticky and Starr have continued as a duo, with numerous collaborations. Although they released the collaboration album Wakedafucup with Snowgoons in 2014, and Shotgunz in Hell with Dope D.O.D. in 2017, their last proper album was Triggernometry in 2003; thus, their newest release Black Rock is Onyx’s first proper studio album in nearly 15 years. Some songs contain that classic Onyx sound. The song “Black Rock” was originally released numerous years ago, but still sounds modern. With a persistent guitar strum dominating most of the song, it will remind listeners of whom Onyx is. Reintroducing everyone to who they are, it’s a classic Onyx song, and sometimes straying from your roots isn’t a bad thing. “O.D.” is a similar track, with the same metal influenced guitar and consistent drum. The lyrics is on the border of parody, with numerous references to overdosing and various drugs, and as a tribute as well. R.A. the Rugged Man makes an appearance too, and he actually fits in nicely. “What U Want From Me” also doesn’t part ways with their classic sound. Sometimes trying to fix something that isn’t broken is a good idea, and Onyx knows to not get too experimental. “Lighters” is a party heavy song, with a hard bass and drum throughout the song, and vocals that chant perfectly with the song. The classic Onyx groove is there, and is a notable track. Other tracks aren’t as classic heavy, though. As mentioned, Onyx doesn’t get too experimental but tries to break away a bit, such as “Lighters.” Other tracks like “Blinded by the Light” takes a softer approach, though. With a chorus that would fit better on an R&B track, it attempts to mellow out the album briefly. The beat is vastly slower than the rest of the album, and overall, the song doesn’t fit with the album. The chorus sounds like it’s trying to be soulful, but falls quite flat. “Greatest Day” is another example of this, featuring similar characteristics. The song isn’t as mellow as the previously mentioned song, but still has an optimistic vibe to it. The lyrics themselves are also positive, but again, doesn’t really fit on the album. One minor bothersome feature are the skits on the album, such as “Onyx! !” and “Lighters Intro.” They sound like as if it was recorded in a live setting, and the skits are watered down, as opposed to the classic ones on their debut Bacdafucup. There just doesn’t seem to be any effort in them. Onyx still knows how to perform some decent wordplay. “Love Is a Gun” has a cool theme to it, basically comparing a weapon to a female companion, with the object being the most familiar to the protagonist than anything else in the world. The beat itself flows with the vocals, not taking a heavy hitting approach, nor a super mellow approach, it’s fittingly in the middle. “Chasing the Devil” is another good metaphor track, and is a decent closer to the album. This song is heavy on the features, with Snak the Ripper, Optimus, and Sickflow on it. It’s also the closer to the album, and features a brief conversation at the end, basically self-reflection as a whole. Black Rock might not be the most diverse album on the streets, but Onyx knows when to draw the line between keeping the classic sound and trying to experiment a little bit. 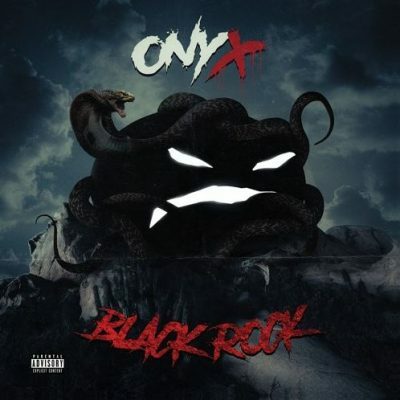 At times, trying to branch out falls flat, but for the most part, Onyx recognizes themselves appropriately, and Black Rock is a solid new pebble in the hip-hop world.